How safe are my riding boots for riding? Each time I look at riding footwear on offer, I am amazed by the lack of thought given by the manufacturer of the needs to the rider whilst in the saddle. Almost all boots are designed for use on the ground only. Just one example is how little attention and importance is placed on the width of boots in relation to the width of stirrup irons. Because the chunkier look has become more fashionable, many people now ride with boots that are too wide for their standard stirrup irons. Few footwear designers are horse riders and therefore stirrup iron widths are unlikely to have been taken into consideration. Accidents do happen, like it or not and in order to avoid the rider becoming trapped in the stirrup iron, it is essential that there should be enough space for the foot to dislodge itself. 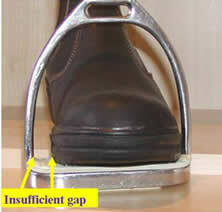 Whilst one is in the saddle the foot is positioned at an angle in the stirrup iron. For this reason the width occupied in the stirrup iron by a riding boot will be the widest width of the boot + an additional 7%. In order to avoid the risk of the foot becoming trapped, it is advisable that the gaps on both sides of the boot should be at least 1 inch combined. It cannot be relied upon that a consumer is aware of the consequences of purchasing a boot wider than normal and when selling for example a boot which is 4 ½ inch wide, for safety reasons, a retailer should make the customer aware that it may be necessary to upgrade his stirrup irons to a wider width. Equitector riding boots have always considered the safety of riders to be a priority and this problem was taken into account when designing our range of Hoof Proof riding boots. 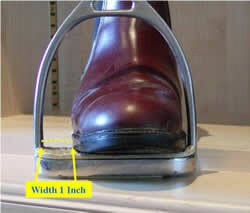 Although all our boots have steel toe caps, we have designed to a be used safely with standard width 4 ½ or 5 inch stirrup irons (dependent on size of the boot).